As Chairman of Hitachi Systems Security’s Board of Directors since 2015, Masahiro Takano leads and oversees all strategic planning to make Hitachi Systems Security one of the major global security companies. With over 35 years of experience in the information technology business, Masahiro has held key leadership positions for Hitachi Ltd., started new business units and held advisory positions of multiple venture companies. 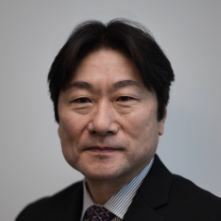 Currently Senior Vice President and Executive Officer of Hitachi Systems Ltd., Masahiro is responsible for expanding the organization’s security, network and cloud integration business with several group companies. Masahiro joined Hitachi Ltd. in 1979 and has since engaged in the development of storage-related products and served as the Lead Engineer of enterprise RAID systems that have become more than a 4 billion dollar business globally. As the leader of global business operations, Masahiro contributed to the promotion of Hitachi’s global storage solution at Hitachi Data Systems Corp. After joining Hitachi Systems Ltd. in 2012, Masahiro has contributed to the increase of the revenues of the related business group to more than 180% within four years through a combination of organic expansion strategies and several successful acquisitions. In addition to his executive position at Hitachi Systems Ltd., Masahiro also serves as the Chairman of the Board of Directors of Cumulus Systems Inc., a US-based software company for system performance monitoring, and serves on the Board of Directors of Hitachi Systems Power Services Ltd., a Japan-based IT services company for electric power operators. As Director, Senior Vice President and Executive Officer of Hitachi Systems, Ltd., Yoshinori Okami leads the Business Cloud Services Group, including the Global Business Division, the Business Cloud Services Sales Management Division, the Network Security Services Division, the Smartsourcing and Services Division, and the Contact Center and Business Services Division. His mission is expanding Business Cloud services not only in the IT market but also in the BPO market with core data and contact center operation services globally. Prior to this position, as Corporate Chief Engineer of Hitachi, Ltd. Information & Telecommunication Systems Company, Yoshinori was responsible for this Company business, especially technology parts. Since joining Hitachi, Ltd. in 1980, he has been appointed to various positions in storage development. In October 2005, he was named president of the Disk Array Systems Division. From 2008 to 2011, he was assigned as Executive Vice President and Chief Strategy Officer of Hitachi Vantara (formerly Hitachi Data Systems) and led a global re-engineering group with a primary focus on supply chain and process improvements between Hitachi Vantara and Hitachi, Ltd. Since Hitachi Systems, Ltd. acquired Hitachi Systems Security in 2015, Robert Lawrie has been an outside director. He brings nearly 40 years of global corporate experience from corporate directorships in the U.S., U.K., Luxembourg and Canada. He is also Chairman of the Hawk Capital Group of companies in Europe and Canada, merchant and M&A bankers. Previously, he was in private and corporate law practice in the U.S. and Canada and was a partner in the private equity firm CVC Capital Partners in London and Frankfurt. Robert has extensive experience in not-for-profit governance, and is currently Board Chair of the Canadian Cancer Society, Canada’s largest health charity. Robert’s law degree and BA are from the University of Toronto. Robert has extensive experience on not-for-profit boards, finance and capital campaign committees primarily in healthcare and dance. He is a passionate cyclist and has captained the Docs’ Choice – Mercedes-Benz team for the last five years in the Princess Margaret Hospital (Toronto) Ride to Conquer Cancer. Robert’s law degree and BA are from the University of Toronto.